At the enterprise level, size often means complexity. Sure, the idea of streamlining your print environment sounds fantastic—but then you think of all those hundreds or even thousands of print servers deployed throughout your organization, each one tailored to its own micro-environment using GPOs and scripts. Suddenly it seems like less hassle to stick with the devil you know. It may seem like you’re simply too big to simplify. Well, eliminating print servers really can be as straightforward as it sounds—no matter how many printers or print servers you have. 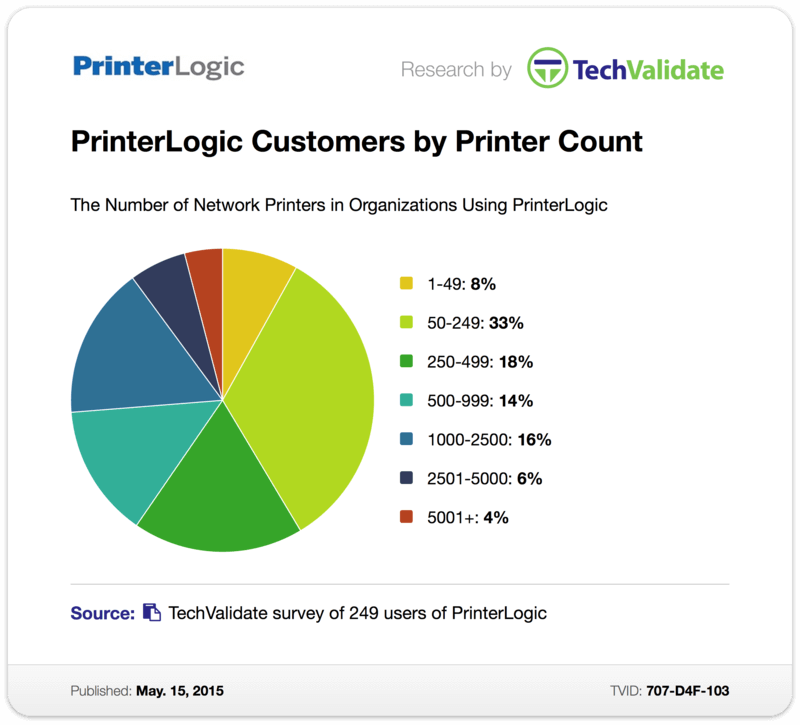 A recent TechValidate survey of PrinterLogic customers revealed that 42% manage more than 500 printers. Over one-quarter of them manage more than 1,000 printers, and 10% have more than 2,500 printers. And despite the size of these organizations, they’ve eliminated print servers and centrally manage their printers with PrinterLogic—a single, infinitely scalable solution that makes print servers look like ancient history. Cost savings: Wake Forest Baptist Health—which deploys more than 6,400 printers to 30,000 end users—says the ROI "has been incredible" with PrinterLogic. Why? When you eliminate print servers, you're saving money on hardware as well as all the man-hours spent troubleshooting, managing and developing custom code. The cumulative savings (an ROI of over 300% in some cases) is impressive, and it naturally grows with each print server you eliminate. Automation: Whether you have one print server or one thousand, PrinterLogic takes care of all the hard work. GPOs and discrete scripts? No longer necessary. The intuitive web-based admin portal allows you to deploy printers by group, container, IP range or a host of other criteria. And, of course, there's seamless support for Citrix, VMware, and other virtual technologies. Management en masse: With PrinterLogic, you can create or modify five, five hundred or five thousand printers in one fell swoop. The find-and-replace function allows you to change a number of attributes such as assignments, drivers, ports and comments efficiently. Or maybe you just want to hone in on a single office printer in the Walla Walla branch? A simple device tree lets you target individual printers with a few clicks. Auditing: You could definitely file this one under "cost savings" as well, but its advantages are worthy of a separate highlight. The at-a-glance reporting of PrinterLogic makes it easy to determine which printers are used most heavily. Data points like date, time, printer, user, computer, color and document name are all readily available, enabling you to track usage throughout your entire organization in an incredibly granular way. So maybe it's true that size equals complexity—as long as you're still using print servers. As our surveys and case studies have clearly shown, the larger your organization, the more complexity you stand to shed by implementing the PrinterLogic enterprise printer management solution. Check out our comprehensive white paper that goes into much more detail about the advantages of PrinterLogic and the ease with which you can eliminate print servers throughout your entire organization.